Greece’s Septicflesh must surely stand as one of the great heavy metal comeback success stories in recent memory. Following their breakup in 2003, they returned in 2008 with the very well regarded Communion, and have since that time continued to refine and (mostly) improve upon their orchestral, symphonic death metal. Though Septicflesh have been very consistent since their reformation, 2014’s Titan saw them stumble a little in my eyes. The richness of the band's orchestrations were just as potent as ever, but the songwriting didn't quite hold up like it had on Communion and The Great Mass. Sadly, I have similar complaints with album number 10, Codex Omega. Like those aforementioned albums, Codex Omega is a dense and richly layered symphonic feast with The City of Prague Philharmonic Orchestra once again lending their considerable talent to the proceedings. Anyone familiar with the band's recent output will know just how busy their arrangements can tend to be with so many elements operating in unison, but the clean and punchy production goes a long way towards making sure that everything has space to breathe while simultaneously helping the album to sound great to boot. But despite being an experience that is truly pleasing to the ear, I do have some gripes with Codex Omega, and they are roughly twofold. The most important of my issues is that despite the richness of the orchestrations and the intricacies of the arrangements, little of interest actually happens during the album’s 10 tracks. This may sound like a contradiction if the compositions are so intricate, but the complexity of the songs isn't the issue for me. It's the surprising dearth of meaty hooks to sink your teeth into. There are certainly moments here and there that stand out more than others, but I've found myself hard pressed to remember anything even approaching a specific riff or melody in the couple of months or so that I've had and been listening to the promo. The most enduring quality for me has been a vague sense of the hint of moroseness at the heart of the symphonic accompaniment. This is fine and not without its merits, but I really want an album, regardless of the genre, to resonate with me much more deeply than Codex Omega has, and general reminiscence of a mood or vibe just isn’t enough. In a similar vein to my first issue, my second is that there just aren't any surprises to be found here. No doubt Septicflesh are focused on refining a particular style and sound (which they still do very well), but when they stick to this plan and pair it with material that makes as little of a mark as the 10 tracks on offer here do, it's hard not to feel like they're treading water and that we've done all of this before. The experience is still a pretty good one despite this, but I think there's a fair case to be made that the law of diminishing returns is starting to take a sizeable hold on the band. 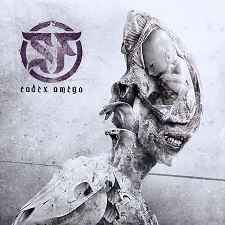 Though I didn't get as much as I would've liked to out of Codex Omega, it's still a solid album that's been meticulously constructed, and I’d imagine that anyone who has enjoyed the band's recent output will enjoy this one as well. I do have to wonder just how much longer it'll be before Septicflesh shakes up their approach a little though, because I think we've just about reached the point where it’s becoming a necessity.